Apple pie is easy to make, use half the quantity of butter (8oz)to plain flour (16oz) with a pinch of salt, rubbed together until they resemble breadcrumbs then bind with ice cold water and leave in the fridge for about 20 mins (easier to roll out). The apple filling is made from bitter cooking apples like Bramleys, which are peeled, cored and cut into chunks, topped with a layer of sugar to taste, spiced up with a couple of cloves (optional). Fresh rhubarb can be used as a filling instead but then its a tart not a pie? 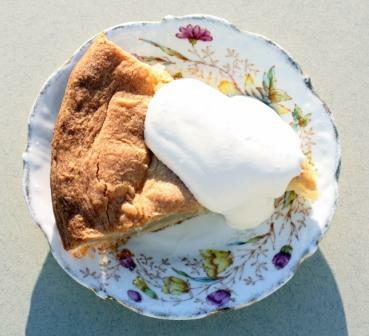 For some strange reason we call the above apple pies and rhubarb (pies) tarts? dont ask. Anyway fresh rhubarb tarts in season (Spring) are rare but divine.